Samuel Morse was the brother of Sidney Morse, owner and publisher of The Observer. Sidney’s dearest friend was Elihu Baldwin, pastor of a thriving church in New York City. When Edmund O. Hovey visited Baldwin in New York and asked him to serve as Wabash’s first president this area of Indiana was known simply as “the West” and was considered extremely dangerous. Sidney Morse supposed that if his friend Baldwin took the post, he might die in the effort. With this in mind, Sidney asked his brother Samuel F.B. Morse, a well-known portraitist of the time, to do a painting of Baldwin for Sidney to keep close. When Baldwin died just five years after taking the post, Morse sent the painting to Mrs. Baldwin. A copy was made and given to the college, this copy hangs in the Chapel yet today. The original was gifted to the college upon the death of President Baldwin’s children. Samuel Morse lives on in our history because of the huge changes his science work had…the telegraph changed the face of the world. Samuel’s destiny was, he was sure, to be an artist. He studied abroad and while he had done a number of portraits on commission, it was clear that this alone would not support a family. Morse was also of a very inquisitive and analytical mindset and always interested in mechanical things. It was while returning to America in 1832 and chatting with some other fellows shipboard that he really started thinking hard about the telegraph and what would become the Morse Code. When Morse succeeded in securing from Congress the money to hold a demonstration of the telegraph to send and receive a message from Washington, DC to Baltimore and back, the message that was chosen “What hath God wrought?” was picked from the Bible by the daughter of Henry Ellsworth, a Yale classmate of Morse’s. Morse had promised that Miss Ellsworth could choose the item to be broadcast. Ellsworth was teaching at Wabash College prior to accepting the government position. 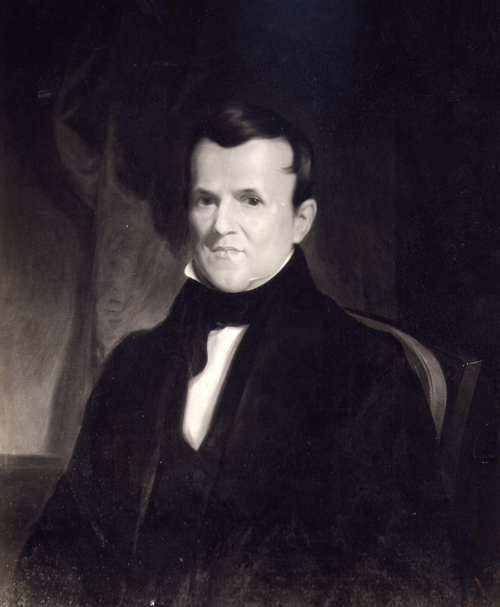 Ellsworth left Wabash to become the U.S. Commissioner of Patents. It was to be through his science that the world best remembers Samuel F. B. Morse but in an interesting twist of fate it is through his art that he is most closely tied to Wabash College.